On March 8, 2017, IANGEL was thrilled to celebrate International Women’s Day, and our 4th Anniversary, with a gala luncheon in San Francisco. Aptly titled “Rising Up, Standing Strong,” we urged sell-out crowd of over 120 local attorneys, law students, and activists to do just that. 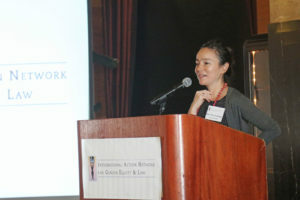 IANGEL’s Executive Director, Cecilia Lipp opened the event with reflections on the International Women’s Day, and noting IANGEL’s progress in four years, building a network to connect the power of pro bono legal services to the cause of women’s rights around the world. East Bay trio Muse Crossing provided beautiful music to the set the mood of reflection and celebration. IANGEL’s president, Nancy J. Newman, noted the serious challenges posed by the current political climate, and urged us to rise up and stand strong for gender equality, using the power of resistance, persistence, and love. We were delighted to honor Kim Thuy Seelinger with IANGEL’s 2017 Rights and Leadership Award, for her steadfast commitment to bringing the perpetrators of systematic sexual violence to justice. In accepting the award, she provided a moving account of the successful prosecution of Chadian dictator, Hissène Habré in 2016. When the verdict was announced, several victims of his regime, some who were assaulted long ago, stood up and began singing. When she asked what they sang, one replied “the kind of song one has waited 30 years to sing.” Ms. Seelinger reminded us all that the cause of equality and justice knows no borders. Keynote address by Lateefah Simon. 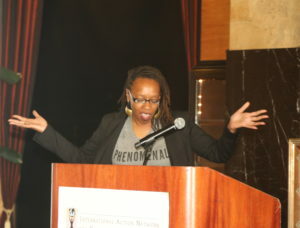 The gala was capped by the lively keynote address of Lateefah Simon. She shared her experience planting seeds that morning, in honor of seven women whose lives were lost this year, sharing a powerful proverb: “They tried to bury us; they didn’t know we were seeds.” Her comments were funny, poignant, and inspiring all at the same time. From her lifelong experience as an organizer and activist, she provided captivating insights on the power that pro bono lawyers have to make a difference in the struggle for gender and racial justice. She was amazing. IANGEL is deeply grateful to table sponsors Hanson Bridgett, Keker Van Nest & Peters, John Chiatello & Lorraine Fedorak, and Rosen Bien Galvan and Grunfeld, musicians Muse Crossing, our outstanding host committee, community supporters, volunteers, and to all attendees for joining us in celebrating International Women’s Day and for their continued commitment to justice and equality around the world. THANK YOU!